Tony grew up in the bar business, learning the craft from his cousin, Helen David, at the Brass Rail Bar in Port Huron, Michigan. 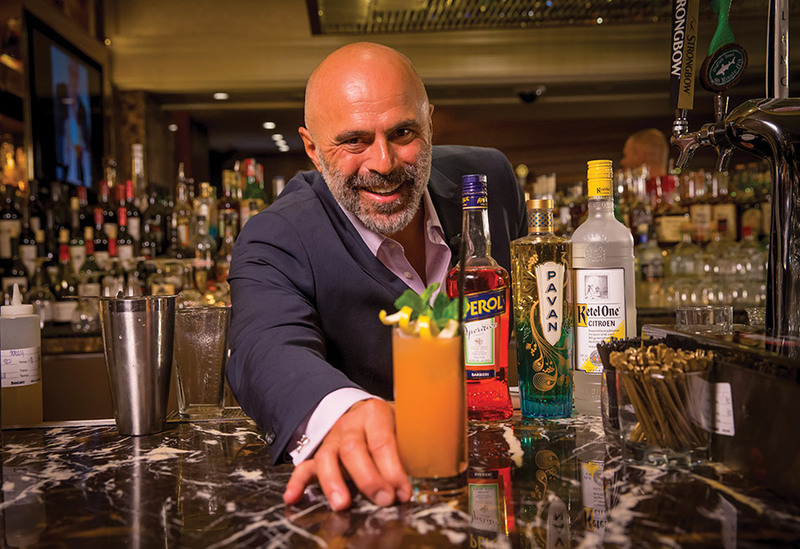 After graduating from college, Abou-Ganim further developed an appreciation for handcrafted cocktails using only the freshest ingredients, while working at Jack Slick’s Balboa Café and then during the opening of Harry Denton’s, a legendary hangout in Fog City. 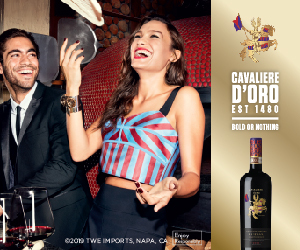 In 1993, he moved to New York City and took a position as the opening bartender at Po, Mario Batali’s first restaurant. Tony later returned to San Francisco to open Harry Denton’s Starlight Room atop the Sir Francis Drake Hotel. It was here that he developed his first specialty cocktail menu featuring several of his original cocktail recipes, including the Sunsplash, Starlight and his most famous of them all, the Cable Car. 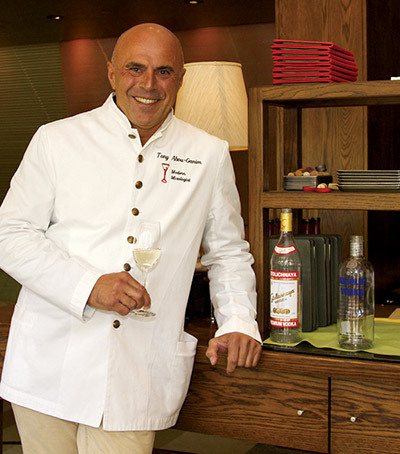 In 1998, Abou-Ganim was selected by Steve Wynn to develop the cocktail program at Bellagio Las Vegas. 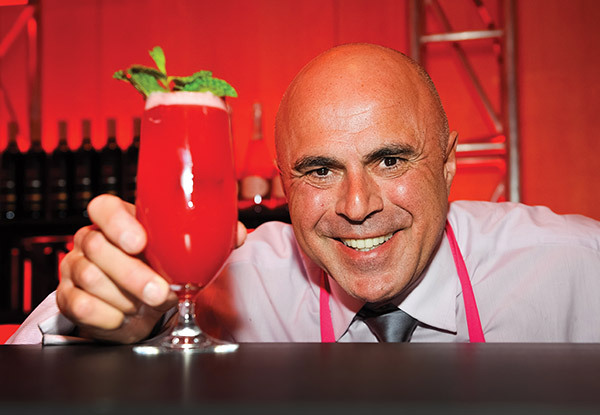 He not only implemented his philosophy of bartending and drink preparation, stressing both quality ingredients and proper technique, but also created several original cocktails for the resort’s 22 bars. In 2002, he won the Bacardi Martini World Grand Prix – one of only two Americans to ever win this title. 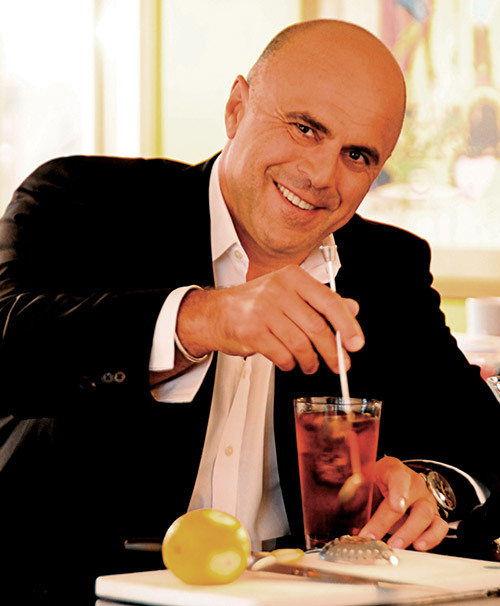 Abou-Ganim has also won three “Iron Chef America” competitions, pairing cocktails with Iron Chef Mario Batali, with Iron Chef Jose Garces and most recently, with challenger Chef Sean McClain. 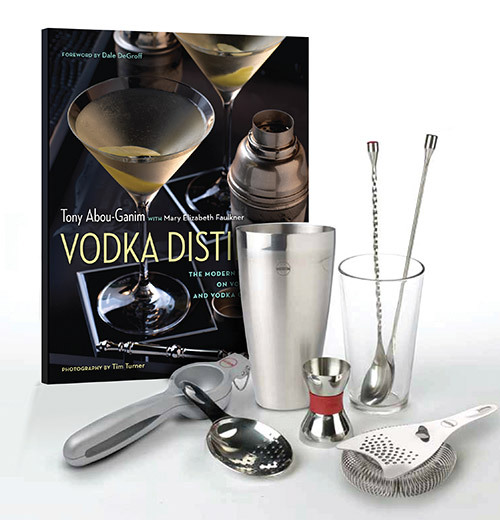 He has also created the signature branded line of Modern Mixologist Bar Tools, available now on his website at modernmixologist.com. MR: Tony, you have been writing about your adventures in the third person using the character of “George” for years now in the popular column, The Adventures of George. How did you come up with the character? TAG: George was my father, who came to the United States from Lebanon in the late 1950s as a very young man. Although he never worked behind the bar himself, his first cousin, Helen David, owned and operated the Brass Rail Bar in Port Huron, Michigan and his brother, my Uncle Charlie, worked the bar for more than 50 years. And it was my dad who convinced Helen in 1980 to teach me to be a bartender. He never visited the places I write about in my column; he didn’t get the opportunity to travel the world before he died, but I have been very blessed to. You see, if he hadn’t talked Helen into making me a bartender, I’m pretty sure I wouldn’t have either, so this is my opportunity to share these amazing experiences. I’m pretty sure he would have enjoyed the journey. MR: You have been quoted as saying, “If I was on a deserted island and they told me I could only drink one thing for the rest of my life, it would have to be the Negroni.” Why the obsession with the Negroni? TAG: The Negroni is one of those magical creations consisting of three simple ingredients coming together in perfect harmony that happens once in a person’s lifetime. I first experienced the Negroni in 1991 while working at Harry Denton’s and let’s just say it was not love at first sip. 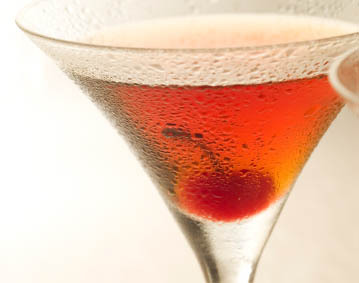 A Negroni needs to be courted – “romanced” as the Italians say. One needs to taste it three times before one falls deeply in love; but once you have, it’s a love affair that will most likely last a lifetime. MR: You are always talking about cocktails; do you enjoy other libations when you’re out socially or at home, if you ever are at home? TAG: I love cocktails but I am an equal opportunity imbiber. I drink most everything. I will say I lean towards more citrus and fruit-forward drinks, such as a Mojito or Sunsplash, during the warmer months and stick to more spirituous drinks, like a Manhattan or Just for Mary, in the winter. 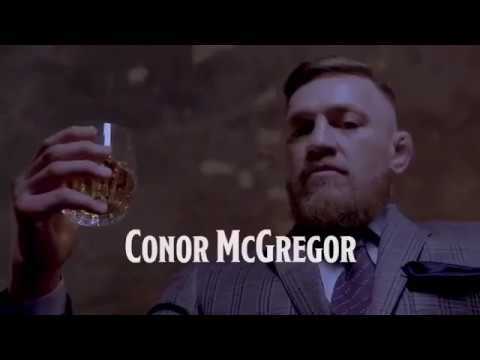 You will also find me sipping on straight spirit, be it a glass of chilled vodka from the freezer or a dram of whiskey over a single ice cube. I also love wine even though I know very little about it, and yes – real men do drink rose. Finally, although I don’t drink a lot of beer anymore, it is a great time to be a beer drinker as the amazing selection of craft beer available today seems to expand daily. MR: I see you are going to be the director of judging for the upcoming San Francisco World Spirits Competition, for the sixth time. There is quite an esteemed group judging the spirits. How do you manage all those products and people? Last year they saw 1,474 products presented for judging. TAG: All the credit for organizing the San Francisco World Spirits Competition and making sure it runs smoothly goes to Chandler Moore, Anthony Dias Blue, their fantastic team and all of the volunteers. But what makes the San Francisco event so special and so well respected is, as you mentioned, the esteemed panel of judges who lend their amazing talents to evaluate what we expect will exceed 1,500 entries this year. For me it has been a great honor and privilege to be associated with the SF Spirits Competition for all of these years and to sit as director of judging for the past six. MR: What is your favorite base spirit to work with? TAG: Can Campari be considered a base spirit? MR: What do you see as some of the trends that may stick this year? TAG: Oh, to have a crystal ball! Well, I think we will see a return to “less is more,” celebrating simpler cocktails, both proven classics and new renditions. Mezcal will continue to grow in popularity, not just with bartenders but also with those who frequent our establishments and request it. Bartenders are already starting to hate less on vodka, and fun vodka drinks like the Harvey Wallbanger will begin to be asked for and served across our bars. And there is nothing wrong with drinking a Cosmopolitan – when made properly, it is a strikingly balanced and complex libation. Making the bar fun again! We have seen some amazing transformations behind the American bar in the past 10 or so years and our guests are drinking better because of it. I don’t see that slowing down at all but perhaps we will loosen the arm garters just a little, and always remember that this business is not all about the drink we serve but making our guests’ day just a little bit brighter. MR: What “elevator speech” advice would you give to up-and-coming bartenders? TAG: Bartending is truly an apprenticeship profession. Take every opportunity to work with and learn from great bartenders. Stay balanced. 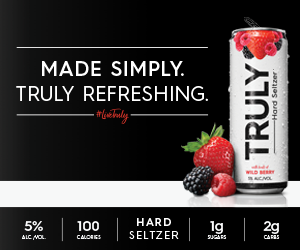 Like a well-crafted cocktail, a bartender must have balance in his or her life. Always leave the pile a little higher than you found it. Never utter the words “It’s not my job”! MR: You’re a regular at the Hawaii Food & Wine Festival, and created the Wuthering Heights cocktail for The Modern Honolulu hotel, made with Sailor Jerry Spiced Rum. On The Modern’s website, I saw that you said, “The dream I’ve always had is to move to Hawaii, open a bar, and have it be open only three days a week so I can really enjoy the life.” Are you having too much fun travelling around the world to settle down to that yet? TAG: Yes, that is a dream of mine, and one day I hope to make it a reality. This is more of my retirement plan than anything else because I think the greatest way to retire is to be able to do what you love to do, as much as you want to do it, when you want to. It may not sound like a very sound business plan to most, but like I said, it’s a dream and dreams can come true. MR: Is there a tiki cocktails book in your future? TAG: I’m pretty sure that all the great tiki books have already been written by cats I respect and who know a whole lot more about tiki than I ever will. Although, a book about making great tiki drinks three days a week on the beach in Hawaii while drinking them the remaining four days, may just be a best seller! As a follow-up to this interview, I talked with Tony on the phone about a couple of topics that are important to him. MR: At the time of this interview, you were getting ready to do the “For the Love of Cocktails” event in Las Vegas. It’s quite the show, and for a great charity also. Can you tell us a bit about the show and its beneficiary, the Helen David Reief Fund? 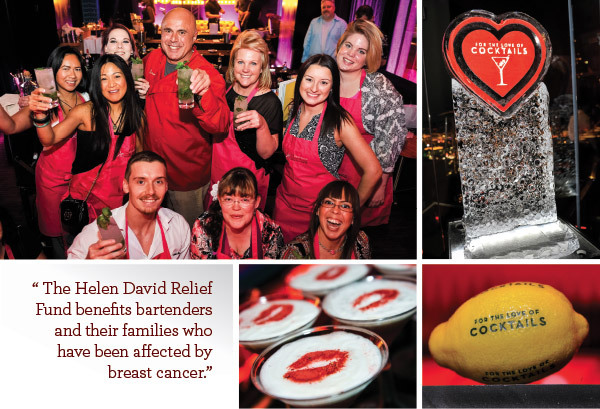 TAG: The Helen David Relief Fund benefits bartenders and their families who have been affected by breast cancer. It’s something I set out on a journey to create, over five years ago. It has been quite a journey (laughing) – to say the least – setting up a nonprofit. We worked with the United States Bartenders’ Guild (USBG) under their 501(c)(3) exemption, in conjunction with the charitable arm of the USBG. It is not necessarily, at least at this juncture, to be able to assist with medical bills, but one thing we’re really hoping to help with are pre-screenings. 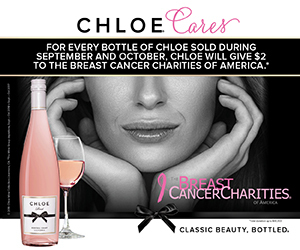 Especially pre-screenings among bartenders and bartenders’ wives who have a history of breast cancer. It’s very crucial because the earlier you detect it, the better. And then to help with the follow-up: things that are not necessarily taken into consideration, such as the electricity has to be paid, grocery shopping, they are off work and not making money and the rent is due, kids need a new pair of shoes. It’s things like that, that are really the things we are setting ourselves up help with. We can only imagine medical bills for something like this, and they would be beyond our reach at this time. We’re trying to ease some of the expenses that go along with being out of work. So that, in a nutshell, is the Helen David Relief Fund. She was my mentor. She opened a bar with her mother in 1937 at the age of 21. She was a two-time survivor of breast cancer, back when breast cancer was really a death sentence to most at that time. She was a very, very strong woman; she passed at the age of 91. They took her from her barstool at the Brass Rail to the hospital just shy of her 70th anniversary. She was an amazing woman and I know she would be honored to know that we have started this. Again, the goal being that 10, 20, 30 to 50 years down the road, Helen David will become an institution that will help many, many bartenders and their families struggling with this terrible disease. MR: I hope so; it sounds like a wonderful cause. TAG: “For the Love of Cocktails” is something that evolved. This is the second year; we hope and plan for it to be an annual event. Last year we hosted our first and it was just a large gala event at miX, at what was at the time The Hotel at Mandalay Bay; it is now The Delano Las Vegas. This year’s gala will be in February at miX and all proceeds will go to benefit the Helen David Relief Fund. But above and beyond that, it’s really celebrating the cocktail craft here in Las Vegas. Virtually every major city in America today has some type of a cocktail festival or cocktail week. We have Nightclub and Bar, but its really not about celebrating Las Vegas and the Las Vegas bartending community. We have one of the strongest chapters of the USBG and we have one of the most diverse and amazing bartending communities. And this, again, is a celebration of the community here in Las Vegas showing our craft. We really reach out to the consumers probably more than we do the trade. We want these to be events where people come to Las Vegas for three or four days and enjoy our city, and they will have an inside look at the bartender’s life. Actually, one of the events, at Herbs and Rye, is called the Bartender’s Life – I’m guessing both consumer and trade will all get together to see what we do. MR: Sounds great! Wish I could be there. TAG: You need to get it on your calendar for next year. 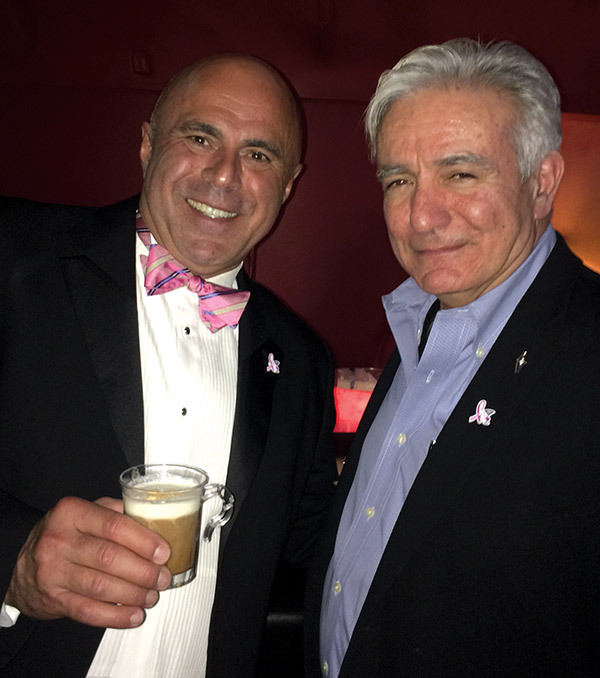 MR: You have been involved with the United States Bartenders’ Guild for many years now, a great organization. This really is the association for professional bartenders. Why should men and women behind the stick get involved? Mario who ultimately introduced me to Dale (DeGroff), who had a really big impact on me in ’93, teaching me that there’s more to bartending than I had previously given thought to. It was the year I made a conscious decision that bartending would be my career and I would just try to be the best bartender I could be. Moving back to San Francisco in 1995, I had the opportunity to work with Harry Denton again and reopen the Starlight Room. I was trying to find a governing body for our profession. In San Francisco there was a union that I was a member of, the Bartenders Union in Oakland (California), but what I discovered was the USBG. 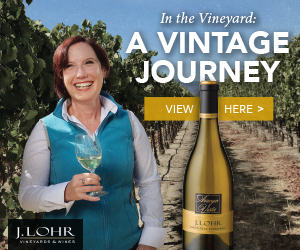 At that time, there was one chapter, and that chapter was in Southern California. When I joined in 1996, it was the only living, breathing (barely) chapter of the USBG. Thank God those guys, Jose and Kana and Fred Ireton, kept the USBG alive. Never in my wildest dreams did I think it would ever get as big as it is today, although I used to always say, it is my dream that one day every state in the union will have a chapter in the USBG, and we are getting really close to that point now. But then again, I never would have thought it would become what is has become now. I’m very, very proud of the USBG. I’m a lifetime member; I promote and sing its praises whenever I can. It’s one of those things that is only as strong as the members. MR: They need ambassadors like you to shout out to people, too. TAG: It’s, as you know, a real interesting time in our profession. I spent the last almost 35 years behind bars – 35 years … yeah, wow. But I’ve never seen this type of excitement and passion and creativity and commitment to the craft. MR: It’s everywhere, too – not just in the big cities like Miami and Las Vegas and New York. It’s spreading everywhere. TAG: Yeah! No, it’s true Mike – one of the most beautiful things is that it is not just New York and San Francisco; it’s Cleveland and St. Louis … it’s popping up everywhere. MR: Even the chain restaurants are highly mixed. They’ve really come to the table. 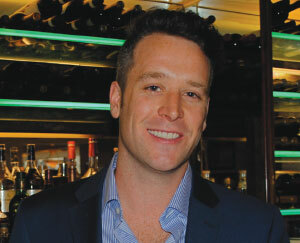 Not just chains such as Appleby’s – I’m talking about the hotels that have auxiliary restaurants and so on. Some of their menus are fantastic. TAG: Absolutely! Where the bar, for a long time, the bar was just an afterthought, almost a waiting room while your table was getting prepared for dinner. There’s as much focus being placed on the bar and the cocktail program now as there is on the food. You’re seeing chefs getting more involved and taking more of an interest in the cocktails that are being served because, again, really the first experience at that restaurant is generally with a drink at the bar. I remember the only time you’d see a chef was at closing when they were done and they would come out to get their shift drink (laughter). Now there’s great synergy between the kitchen and the bar. You nailed it – now virtually every level of dining from white tablecloth down to the most casual, they are putting emphasis on the bar and the drinks they’re serving. It’s great; we’re all drinking better because of it. MR: I’ve been around a long time, longer than you actually (laughter), selling liquor since ‘82 up until ’95, and then doing this magazine. 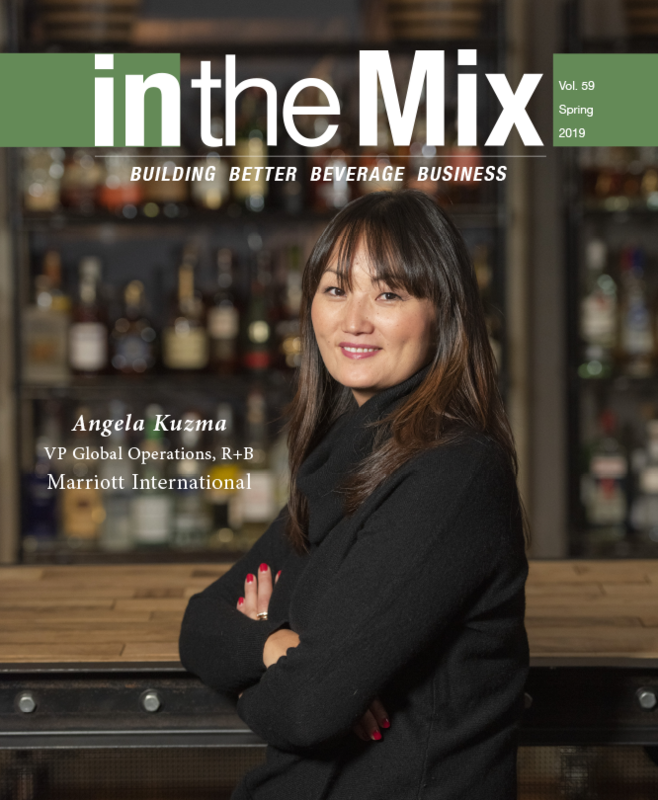 This has been the biggest period (of mixology) I have seen in my history of being in the liquor business. TAG: I don’t see it letting up. I see things continuing. It’s always great to push the envelope and see how “out there” we can get. But one of my predictions is a return to simpler drinks that are a bit more approachable, but yet really focusing in on the details surrounding those drinks: the quality of the glassware, the ice and everything – the details.